Are essential oils a healthy alternative to the chemicals we are constantly exposing our furry friends to? The answer is not as simple as yes or no; essential oils can be beneficial to dogs, but also harmful. Dogs have extremely sensitive noses compared to humans, so essential oil dosage is very important. While certain essential oils can be toxic, other essential oils can be useful as flea and tick prevention, an aid in soothing skin irritations, for calming nervous dogs, and other remedies. Lavender is one such essential oil. The calming effects of lavender are well known by humans. Walking by a field full of blooming lavender flowers is a delightful experience and has a soothing effect. The same effects can be felt by our canine friends. Lavender essential oil produces a calming sensation and can be useful when traveling with pets to help them relax and fall asleep. Whether used for a nervous dog, a restless sleeper, a pooch with some ouchies, or just to create a calm relaxing environment for your fur child, lavender essential oil is a must have for any dog owner. CALMING Diffusing lavender or adding a drop to their collar, can calm your dog as much as it does you. Effective for relaxing anxious or nervous pups whether the stimulus is travel, fireworks or thunderstorms. For maximum benefit, use before they encounter the nerve-wracking situation. SOOTHING Add a few drops to your pets’ shampoo to soothe dry, itchy skin or bug bites. Add a few drops to their shampoo at bath time. HEALING Lavender’s antibacterial properties may be used to treat wounds like hot spots, burns or ulcers and reduce scarring. Though lavender can be beneficial for dogs, it is not considered safe for use with cats, and is not recommended for pregnant/nursing dogs. Be sure to test a small amount on your dog or consult your veterinarian before full or frequent use. Helps decrease inflammation and swelling, loosen tight muscles & soothe away pain. Cover with hot wash cloth after applying for that extra ahhhh! Add coconut oil and beeswax to jar. Place jar in a saucepan with 2 inches of water over medium low heat. Stir to melt/combine. Cool slightly before adding essential oil. Mix well. Allow to set in jar or pour mixture into metal tins or storage containers to share with friends and family. Plan ahead and prepare your small travel bottles of “must have” travel oils before heading out on your next adventure. RELAX Are you a person who stresses when flying? Be sure to keep a small vial of Neroli oil handy. Apply a few drops to your palms and inhale deeply for a few breaths to calm the nerves you feel during takeoff. If you’re not traveling, give yourself permission to relax amongst the holiday parties, shopping, baking, and entertaining. Take a breather, a few moments of quiet and inhaling the scent of Neroli will restore your inner calm. ENERGIZE Jet-lag from long distance air travel or just plain lack of sleep can turn you into a Grinch. Greet the day with our Energize Essential Oil blend, helping you wake up and move! Spray in the shower just before stepping in or add to a warm wet washcloth and breathe in for an instant pick me up! REST Even if you’re staying closer to home this season, you might find that changes in routine disrupt your sleep patterns. Lavender has been found to help you fall asleep, sleep longer and have a more restful sleep. Rub on your feet, temples, wrists (or anywhere) for an immediate calming effect on the body. With the holidays just around the corner, it is an important time to examine the merits and importance of Balance. As a yoga teacher, I oftentimes discuss the concept of balance on a daily basis, whether it’s balancing as a standing posture such as Warrior 3 with a leg extended behind, as well as the importance for internal balance within. It’s important to think about the components of balance, and what attributes to staying in balance, especially when life can be overwhelming. What better way to explore balance then by examining the signature blend of the Red Silk Essentials Balance essentials oils blend, and how that may relate to tips in general we can benefit from to achieve, and more importantly, maintain, balance. The most important thing to remember with Balancing, both on and off the mat, is relaxing, and allowing the breath to slow down to help find your center. 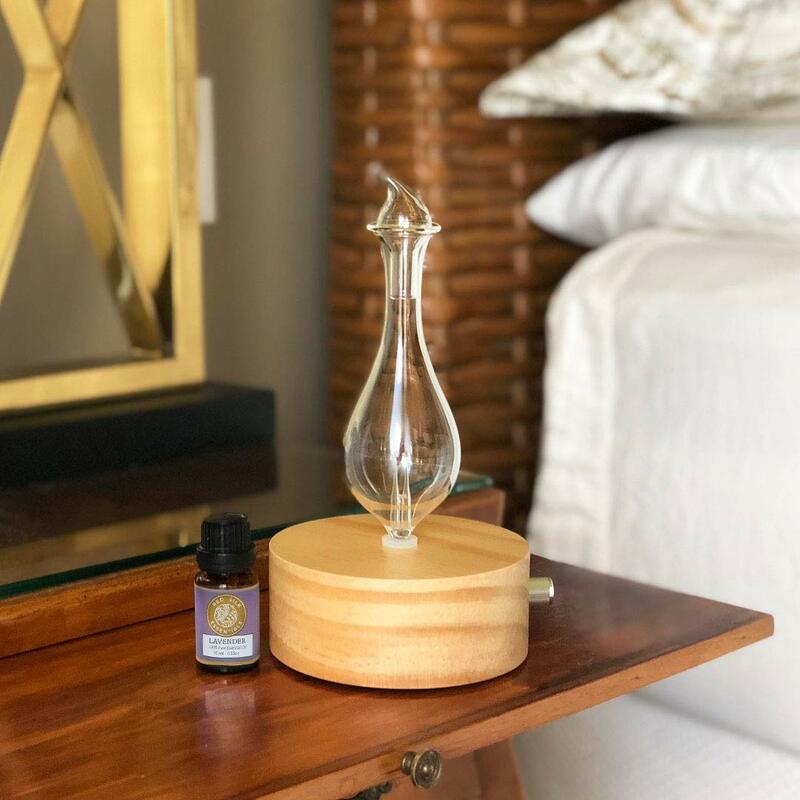 Our signature Balance blend includes Bulgarian Lavender to help reduce sensations of anxiety and fear, coupled with Ho Wood sourced from Asia to calm emotions. The healing powers of Indian Frankincense soothes overactive nervous systems, promoting sensations of blissful ease and calming relaxation. Taking a deep breath of our Balance blend will help the mind, body, and spirit relax, and find peaceful comfort. Grounding is also key in balance, anchoring and relaxing the toes (and perhaps, hands) in a balancing posture, or allowing your feet to be bare on the earth to emotional ground as well. There’s quite a lot of study on the practice of grounding, quite literally walking barefoot in nature, which helps to anchor the body, improving blood circulation while reducing stress and even pain. Similarly, our Balance blend incorporates grounding elements of Spruce to center yourself and provide emotional release. The incorporation of Ho Wood brings a calming, centuring effect. The addition of Frankincense will aid in lifting the spirit while improving your overall attitude and disposition, further encouraging grounding and centering. Focusing helps to not only establish but maintain Balance. In yoga, this can be done with the drishti point, or focused gaze, bringing awareness to one point while moving into a balance posture. Focusing before an important meeting or call can bring similar calming, grounding effects, balancing and aligning the mind and body to be properly prepared. The grounding nature of Spruce in our Balance blend stimulates concentration and memory powers, with the addition of Ho Wood activation and generating new cell growth, working together to help you be balanced and focused. This blend is a great asset to have on hand in the office for heightened awareness and focus. Alignment is another core element of yoga, while also bringing teachings off the mat as well. Finding and maintaining symmetry allows our bodies to stay in balance, which we integrated into our Balance blend as well. Both Frankincense and Lavender aid in easing stressful moments while aligning the body in balance. Ho Wood promotes deep relaxation, while Spruce maintains a sense of grounded rootedness, encouraging the mind and body to align in symmetry. Do you have any other good tips for finding Balance? Share them with us on facebook and instagram #redsilkessentials. We look forward to hearing how you find and maintain Balance with our signature blend! To order and learn more about our Red Silk Essentials Balance blend, please visit our website store. Ashley’s lifelong journey of wellness and spiritual alignment has manifested with daily yoga practice since age 17, teaching Bay Area residents vinyasa, meditation, restorative and prenatal yoga in several local studios. She is currently hosting global retreats, workshops, group energy and sound healings, including her upcoming I AM Balanced Retreat in Livermore, CA on November 9-11, 2018. She was certified 200 RYT at Maui Yoga Shala in November 2014. Radiation energy emitted from the sun is a form of ultraviolet rays (UV). There are two types of rays that reach earth, UVA and UVB. UVA rays (the dominant tanning ray) have a longer wavelength and can penetrate two layers beneath the skin into the dermis. UVA have long been known to play a major part in skin aging and wrinkling (photoaging). Recent studies, however, show that UVA damages skin cells in the basal layer of the epidermis, where most skin cancers occur. Broad spectrum sunscreens protect against both UVA and UVB rays; however, SPF only measures a sunscreen’s ability to filter UVB rays. SPF is a measure of how much solar energy (UV radiation) is required to produce sunburn on protected skin (i.e., in the presence of sunscreen) relative to the amount of solar energy required to produce sunburn on unprotected skin. It is not directly related to time of solar exposure but to amount of solar exposure. It is a common mistake to assume that the duration of effectiveness of a sunscreen can be calculated simply by multiplying the SPF by the length of time it takes to suffer a burn without sunscreen, because the amount of sun exposure a person receives is dependent upon more than just the length of time spent in the sun. Generally, it takes less time to be exposed to the same amount of solar energy at midday compared to early morning or late evening because the sun is more intense at midday relative to the other times. Solar intensity is also related to geographic location, with greater solar intensity occurring at lower latitudes. Because clouds absorb solar energy, solar intensity is generally greater on clear days than cloudy days. Additionally, other factors such as your skin type, amount of sunscreen applied and reapplication frequency influence the amount of solar energy exposure. Sunbathers often assume that they get twice as much protection from SPF 100 sunscreen as from SPF 50. The SPF scale is not linear and in reality, the extra protection is negligible. Properly applied SPF 50 sunscreen blocks 98 percent of UVB rays; SPF 100 blocks 99 percent. When used correctly, sunscreen with SPF values in the range of 30 to 50 will offer adequate sunburn protection, even for people most sensitive to sunburn. • Zinc oxide and titanium dioxide do not absorb into the skin and provide sun protection as soon as they are applied. • Both zinc oxide and titanium dioxide provide protection against UVA and UVB rays. • Zinc oxide has strong anti-bacterial and anti-inflammatory properties. • You must wait 15-20 mins after application before it provides adequate protection. • The chemical reaction occurs under the skin’s surface, increases skin temperature and may cause redness. • Multiple chemicals are required to achieve high SPF and UVA + UVB protection, and many cause skin irritation. • Oxybenzone, a common ingredient, may be linked to hormone disruption. • Use a broad spectrum mineral sunscreen. • Stay away from aerosols, you are likely not applying a thick enough coating and it is not something you want to inhale. Water is your body’s principal chemical component and makes up about 60 percent of your body weight. Your body depends on water to survive. Every cell, tissue and organ in your body needs water to work properly. Lack of water can lead to dehydration — a condition that occurs when you don’t have enough water in your body to carry out normal functions. Even mild dehydration can drain your energy and make you tired. If you do any activity that makes you sweat, you need to drink extra water to cover the fluid loss. It’s important to drink water before, during and after a workout. Also, hot or humid weather can make you sweat and requires additional fluid intake. Dehydration also can occur at high altitudes. While water doesn’t have any magical effect on weight loss, substituting it for higher calorie beverages can certainly help. Also, foods with high water content tend to look larger, their higher volume requires more chewing, and they are absorbed more slowly by the body, helping you feel full. Water-rich foods include fruits, vegetables, broth-based soups, oatmeal, and beans. Your skin contains plenty of water, and functions as a protective barrier to prevent excess fluid loss. Dehydration makes your skin look dryer and wrinkled, which can be improved with proper hydration. You can also help “lock” moisture into your skin by using moisturizer, which creates a physical barrier to keep in moisture. Body fluids transport waste products in and out of cells. The main toxin in the body is blood urea nitrogen, a water-soluble waste that passes through the kidneys to be excreted in the urine. Your kidneys do an amazing job of cleansing and ridding your body of toxins as long as your intake of fluids is adequate. Water is a nutrient your body needs and must be consumed in some form to replace the large amounts lost each day. Why not enjoy the added benefits of fresh and vital water by recharging your water with a VitaJuwel Gemstone water bottle or decanter. Drink it Pure, Natural and Energized! Essential oils are extremely concentrated oils that need to be handled with care and used correctly. Carrier oils are fatty vegetable oils used to dilute the essential oil, so it can be applied easily and safely to the skin. While they dilute the essential oil, carrier oils do not eliminate their positive properties. In fact, they can even enhance the effect of the essential oils and alter the absorption rate. Most carrier oils are loaded with essential fatty acids, antioxidants, anti-inflammatory compounds and skin-healing vitamins. Carrier oils let you cover a larger part of your body without using too much essential oil. Essential oils are made of small particles that are absorbed quickly. Carrier oils don’t evaporate as fast so by adding the two, the absorption rate is slowed, allowing a longer impact. Here is a list of some of the carrier oils we like. Coconut oil (refined) Fractionated coconut oil is a fraction of the coconut oil from which almost all the long chain triglycerides are removed, thus leaving mainly the medium-chain triglycerides and making it an absolutely saturated oil. Pros: Completely soluble with other oils. Extremely light, and absorbs quickly into the skin without clogging pores. Super moisturizing, odorless, colorless and does not stain. Has a long shelf life. Cons: Refined – Virgin coconut oil has a higher antioxidant capacity. Jojoba Oil This oil’s composition is closest to our sebum, or the body’s natural oils and can help to balance oil production in the skin. Pros: Moisturizing without being greasy – great for oily skin. Contains vitamin E and B vitamins and has antifungal and anti-inflammatory properties. Easily and quickly absorbed. Has long shelf life. Cons: Has a mild aroma. Avocado oil The fruit of the avocado tree is almost one-third oil and is one of the thickest, most luxurious oils on the list. A good oil to use for anti-aging as it contains palmitoleic acid, known to moisturize and tighten the skin, and enhance skin elasticity to prevent symptoms of premature aging, such as wrinkles. Pros: Very hydrating. Excellent for mature and very dry skin. Reduces inflammation and increases collagen production. Has a long shelf life. Cons: Thick and heavy, sometimes better as secondary carrier oil. Strong scent. Sweet Almond oil A light oil, and very easily absorbed by your skin. Almond oil works wonderfully for all types of skin. Pros: Naturally rich in vitamins A, B1, B2, B6 and E. Great all-purpose oil for all skin types. Not too expensive. Cons: May cause a reaction to those with nut allergies. Refrigeration after opening is recommended. Mild aroma. Massage Oil Add approximately ¼ oz. essential oil to 12-14 oz. carrier oil. Salves Add 15 drops of essential oil to 1 oz. of carrier oil. Store in metal or glass container. Great for use on cuts, bruises or sore muscles. Neat Take 3-5 drops of essential oil and put directly onto your skin (if it needs a carrier oil mix with 1 teaspoon of carrier oil). Lightly massage area. A gemstone is a piece of mineral crystal (a single mineral with a visible faceted, three-dimensional, geometric form) or certain rocks (generally formed from multiple minerals fused together) that are strong enough to be cut and shaped (lapis lazuli, jade). Since early times, mankind has been fascinated with the beauty and power of gemstones. Druids used them for healing as well as for religious rituals. Medieval Europeans ground them into powders for medicinal purposes. The Tibetans regarded Quartz Crystals as one of the precious substances of Buddha. Today, gemstones form the building blocks of our modern technological age: Rubies for lasers, diamonds for cutting tools and quartz crystals for electronics are just a few examples. Gemstones represent energy in its most solid form. Each gemstone has its own energetic characteristics that allow us to distinguish one from another as do each of us have our own electro-magnetic fields that are in turn impacted by the energetic quality of each gemstone. When selecting gemstones, the most important guideline is that the stone is appealing to you. The body has a way of being attracted to a gemstone that is appropriate for use at the time, whether you consciously realize it or not. Yoga is a great way to increase your physical and emotional well-being. Whether you are an expert or are just beginning, a good yoga mat spray is a must. Note: Not all yoga mats are treated the same. Spray a test patch before using. As many of you know we are big fans of Protect oil. If you have read some of our previous posts, (Arm Yourself and An Ancient Protective Blend), you can see why. One of my favorite application methods is the bottom of the feet. Essential oils are easily absorbed and reach the bloodstream faster when applied to the soles of your feet. Another great way to use Protect is on your hands. When you are on the go, it isn’t always convenient to wash – try this all-natural hand sanitizer made with Protect oil for that extra level of protection. Add to a high-quality travel size plastic squeeze bottle and shake. No drying alcohol. Moisturizes while it protects.